Hershey Anti-BSL Group is a grassroots association of dog owners and concerned citizens committed to repealing Breed Specific Legislation in Ontario. Through public education, political involvement and the promotion of responsible dog ownership, Hershey’s mandate is to restore fair and equal treatment of all dog owners across Ontario. Hershey supports “breed” neutral legislation applied fairly and equally on a case by case basis. Hershey endorses the City of Calgary’s Responsible Pet Ownership Bylaw, known worldwide as the “Calgary Model” and encourages municipalities to adopt similar legislation. 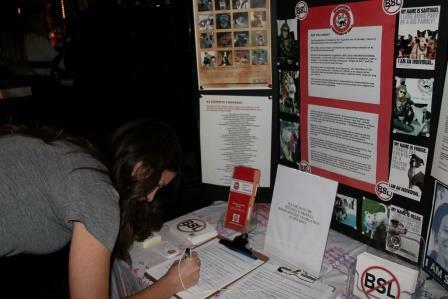 Over the years, Hershey Anti-BSL Group has organized and participated in several rallies in the greater Toronto area, bringing the issue to the street and educating the general public. Hershey has also attended many dog/pet related events as well as concert venues to spread the word and encourage people to become involved. Upon request, Hershey Anti-BSL Group will provide information packages to advocates wishing to distribute information in their communities. Visiting your local dog park, veterinary office or other pet related businesses will go a long way to spreading the word and bring Ontario closer to the repeal of Breed Specific Legislation. Contact us for your information package today! Hershey Anti-BSL Group is not an animal rescue organization. Should you require the assistance of a rescue group within Ontario, please click here for more information.